When you returned for the spring semester, you may have noticed that the way Blackboard does inline grading has changed. Blackboard’s tool for implementing inline grading was called Crocodoc. The company that owned Crocodoc decided to stop supporting it and gave it an end-of-life date of January 15, 2018. The good news is that Box Inc., the company that owned Crocodoc had another tool called Box View that does essentially the same thing. As a result, Blackboard updated its inline grading capability to leverage the new Box View software. Box view offers several improvements over Crocodoc, including improved rendering fidelity (cleaner looking image) and expanded support for new file types. There are some changes that may affect how your grading workflow happens, so what should you expect? We’ve highlighted some important changes. Check out the comparison table below for specifics. Note the addition of almost 100 new file types that are supported as well as the ability to display images and videos within the inline grading interface. One change that may affect some faculty is the inability to download a copy of the student file with annotations. A workaround for this scenario is to use MS Word instead of Box View and track changes. Then, you can just upload the annotated document via the grading interface via a file attachment. Please contact us at blackboard@shsu.edu if you have any questions. I hope that you will have a wonderful holiday and are looking forward to a prosperous new year. 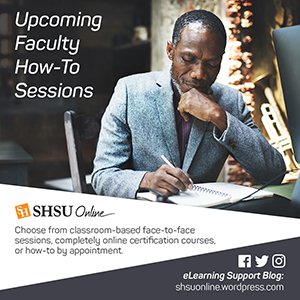 In the spirit of looking forward, here are some strategies that you can look forward to implementing to provide your students with a firm footing and a good start in your online course(s) during the first week. You can place this link in your and it will direct them to where they can download the Blackboard App for iOS, Android and Windows devices. A Video Introduction performs an important function in any online course. One of the drawbacks to digital communication is that it divorces the person from the medium. An e-mail, discussion post or instant message cannot convey meaning or tone of voice. A Video Introduction allows you to speak to the student as you would speak to them in your office or in class. They get to hear as well as see “you” rather than just a paragraph or two of text welcoming them to the course. Giving yourself a social “presence” in the course with a video introduction is an important first step in getting your students engaged and ready to contribute. The good news is that it is easier than ever for you to provide this feature in your course. You can use tools like YouTube, Kaltura or Blackboard Collaborate to upload or directly record and upload your introductory video yourself. Research shows that students who feel they have contributed to a course, or have “co-ownership” of their learning, report a higher level of satisfaction with the course and instructor. One way to start your students contributing early on, is to have them participate in an introductory activity. The activity serves multiple purposes. First it does what it says it does and allows your students to get to know you and each other. Doing this helps them break the ice and feel less wary about reaching out to each other as the semester progresses. Secondly it shows them how to use the tools in the course and gets them in the habit of interacting with each other in the manner set by your instructions. Finally, it gets them started and active in the course. Student who feel like they are not just sitting around, report a higher level of satisfaction and are more likely to finish the course. Note: Since this is the “first” activity in the course, it might be a good idea to model the behavior you want your students to display. Go ahead and be the first person to submit the activity or link to previously used example. Letting your students know what to expect from you and what you expect from them will go a long way toward ensuring a successful experience for them and you in your online course(s). In a brick and mortar class the first day is usually spent covering course expectations, policies and yes the syllabus. You have a captive audience at least for the hour or hour and a half that you have your students in the classroom. Even if the students didn’t seem excited about being there, you know they at least heard you go over the information. In online courses it can be difficult knowing if the students have even looked at your syllabus even though it may be prominently displayed in your course. A great tool to employ to ensure that your students have looked at your syllabus (at least once) is the Syllabus quiz. You can offer questions that point to what you think might be important parts of your grading policy and or course schedule and whatever else you think might be important. The syllabus quiz can have two other benefits besides ensuring your students are least familiar with the Syllabus. It gives your students a first look at the testing mechanism in your online course, and if you employ adaptive release, it can become a gatekeeper for the rest of your course. You can set a point threshold for them to reach in order for them to be able to access the rest of the course. One of the challenges faced by online, hybrid, and web enhanced instructors is keeping your students engaged. This blog post could go into depth about the myriads of streams, hashtags, posts and cat videos that are all competing for your students’ attention. So, rather than go down that particular rabbit hole, we will focus on a way to engage your students…..using the Blackboard app. These are all great features, but you will notice the special emphasis on certain features in the list. These features provide a little extra engagement for your device carrying students. Your students can see an up-to-the-minute list of important course activity including new content, announcements, and grades. The activity stream automatically prioritizes items to help students focus on the tasks that they want to take care of right away. The activity stream shows first when the app is opened. Students tap the menu icon to navigate to their courses and other features. Students can select Grades in the main menu to see a quick view of their grade in each course. They tap a course grade to see submitted assignments, tests, quizzes, and graded discussions. Students can see calculated grades, such as running totals if the them. If a calculated total shows in a desktop browser but not in the app, your school hasn’t updated Blackboard yet. While in a course, students can tap their current grade at the top of the Course Overview to see all of their graded work. They can tap a graded item to view the assessment details, attempts, and instructor feedback. The Blackboard App will keep students up to date and let them know when a test is coming up or an assignment is overdue. It will also send notifications when new grades are posted. These notifications will show up on their smart phone with a buzz or a bing or when the student checks their device. This is Great, Now What? So if you like what the Mobile App can do for your students, what can you do to get them to use it? How about making one of Start Here activities in your course an assignment where students have to submit a screenshot of your course as viewed through the Blackboard app. Provide the link to the app in the assignment instructions for easy access. If the students already have the app, they just need to do the screenshot portion of the assignment.